New: Opens a window that will ask what type of new form you would like. Open: Opens a window containing all your saved forms. Import: Opens a dialog asking to brows to a file to import (note: nex-forms export files only). Save: Saves your current opened form. Save as template: Saves a template form to be re-used. Export: Opens a dialog asking to save the exported file. Preview: Opens a preview window of the current form. Embed: Opens a window containing shortcodes and PHP codes on how to embed (use) your form on your site. Paypal Setup: Opens your paypal settings (like merchant ID, currency language, etc) for the current form (you need the PayPal for NEX-Forms add-on for this menu item to be present. Paypal Items: Opens your paypal items for the current form (you need the PayPal for NEX-Forms add-on for this menu item to be present. Email Configuration: Opens a window where you can setup your default email configuration like using SMTP or wp_mail() etc. NOTE: Not to be confused with submmision email alerts found under Form->Email setup as descibed above. 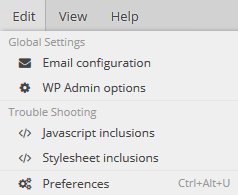 WP Admin options: Opens a window where you can setup a few amin options like disbling NEX-Forms widget etc. Stylesheet Inclusions: Opens a window where you trouble shoot styling problems by selecting which CSS files should be included and which should not. Preferences: Opens a window where you setup your global preferences. These preferences are the defaults to all new forms. 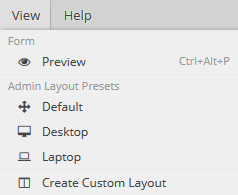 Create Custom Layout: Enables resizing and positioning of the admin panels to be saved as custom admin views. Videos: Opens a window containing tutorial videos. Support: Redirects you to an online support system (http://basix.ticksy.com) where you can create support tickets and be answered within 24 business hours. 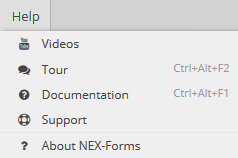 About NEX-Forms: Opens a modal containing information about NEX-Forms: current version etc. This panel includes all your form elements. Click on an element to add it to your form canvas. This panel is the area where you build your forms. Enter your current opened form's title. Preview your current opened form. Save your current opened form. Add grids colums (1-6) to your form for any type of layout. Grids can be dragged into grids with unlimited nesting. 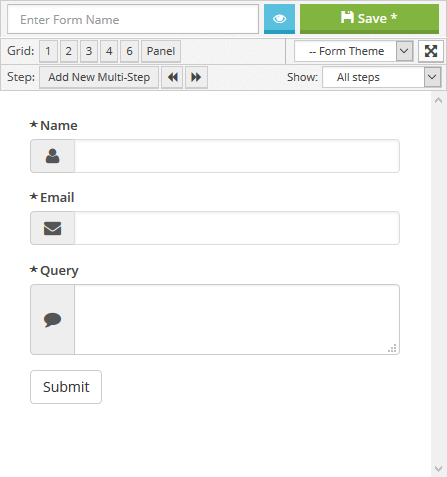 Add Panels to your form. 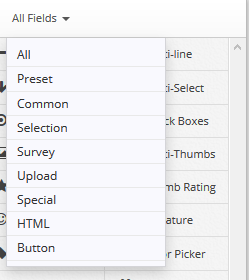 Select yopur form theme (you need Form Themes for NEX-forms add on for this dropdown to be present). Switch to full screen view (help with dragging and dropping elements into grids). Add add new multi-step to your form. Add previous (step back) buttons into your steps. Switch beteen steps to easily manage each step seperately. The task bar contains all your opened forms. Using the taskbar you can easily switch between forms. An unsaved form will have a blue border at the bottom. 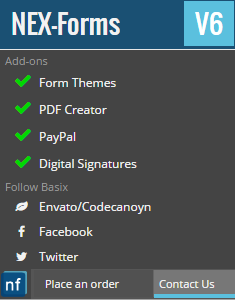 You can also check available add-ons when you click on the the NEX-Forms logo.